Watch Out For The Aguilas | Servinio's Sports Etc. 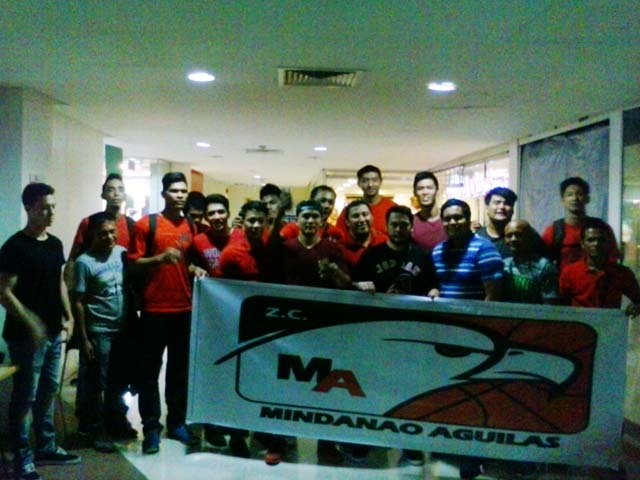 The ZC Mindanao Aguilas are set to take flight in the 2016 PBA D-League Aspirants Cup. ANOTHER COMMUNITY-based team is set to invade the PBA D-League. The Zamboanga City-based ZC Mindanao Aguilas are very ready to match skills with the best the rest country has to offer with a tough and fighting roster in the 2016 Aspirants Cup beginning Thursday (January 21) at the San Juan Arena. Together with head coach Nino Rehji Natividad and team manager Sergei Bien Orillo, Navarro has tapped a core of cagers with Mindanao roots led by D-League veterans Choi Ignacio, and Gino Jumao-as. Also comprising the locals are guards Dexter Garcia, Joseph Nalos and Ar-Raouf Julkipli and forward Jaynard Rivera. Reinforcing the team will be big men Kenneth Acibar, Mark Sarangay and Jericho de Guzman, the D-League’s tallest player at 6’10”. From the Rookie Draft, the Aguilas selected centers JR Ongteco and Ivan Villanueva and guard Taylor Wetherell. Orillo clarified that the team’s top draftee, 6’2” guard Michael Williams of Cal State-Fullerton, will be available by February as he is winding up some contractual obligations in the United States. “I have personally watched him in the States and I believe he will be a potential top three PBA Draft pick this coming August,” he said. Navarro has been very passionate about helping his fellow Zamboanguenos starting at the local level followed by organizing the city’s entry in Liga Pilipinas in 2008. The young businessman is following in the footsteps of his late father, Rolando Sr., who was a basketball patron and an active participant in the formative years of the Samahang Basketbol ng Pilipinas (SBP). This early, the team’s youthful leaders are already looking beyond their initial D-League tournament. “We hope to attract more Mindanao players, not just from Zamboanga but from other cities as well,” said Navarro, who also hinted of the possibility of the Aguilas hosting an official game in Zamboanga in the future. Helping motivate the Aguilas are the success stories of Mindanao PBA players like Peter June Simon, Mark Barroca and Jonathan Parreno. They hope to at least approximate their idols’ achievements. The Aguilas open their title bid against the reigning Foundation Cup champions CafeFrance-CEU Bakers on January 25 (Monday) at the Ynares Sports Arena in Pasig City starting at 2:00 PM. It will be followed immediately by the game between Phoenix Petroleum-FEU and Wang’s Basketball at 4:00 PM. The rest of the field will see Banco de Oro-NU, QRS JAM Liner-UP, AMA Online Education, Caida Tiles and Tanduay Rhum. Hapee Toothpaste has taken a leave and will not be around to defend their Aspirants Cup thus creating an unpredictable championship race. The team has been preparing for two months already, highlighted by winning a local tournament in Zamboanga and participating in the Del League in Marikina City. Despite losing tune up games against future opponents Phoenix and Banco de Oro, Coach Natividad remains optimistic that the Aguilas will give a performance that the people of Mindanao can be proud of. This entry was posted in Basketball, PBA, Sports. Bookmark the permalink.